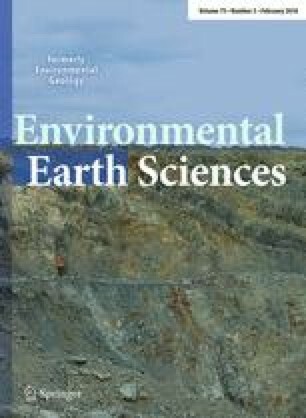 Incidents of hazardous accumulations of CO2 in homes built on or near reclaimed mine land, in the last decade, have been shown to be linked to neutralization reactions between acidic mine drainage and carbonate material. Recent research has shown that CO2 fluxes on reclaimed mine land with this hazard are, sometimes, spatially autocorrelated (i.e., the spatial variability is not random). This result implies geostatistics can be used to delineate hazardous areas where fluxes are likely to exceed established thresholds. This study applies sequential Gaussian simulation to delineate this emerging hazard on a site in southwestern Indiana, USA. Due to lack of regulatory threshold limits for CO2 flux at the current time, the authors conduct a sensitivity analysis of the threshold limit using the 75th, 90th and 95th percentiles of the measured fluxes for the first day of monitoring. These limits are used to produce hazard maps, which are validated with the known hazard at the site. This work further shows the potential of surface CO2 flux monitoring as a cheap and effective strategy to monitor and delineate such hazards to avoid residential and commercial real estate development in high risk zones. The authors would like to acknowledge: Office of Surface Mining, Reclamation and Enforcement’s Applied Science program’s project #S09AC15437 and the Government of Botswana for financial support; Dr. Bret A. Robinson for his assistance in accessing the study site; Alfred J. Baldassare for his input; and Bismark Osei for his assistance in this work. The authors are also grateful for the review comments in response to our original submission. The comments have improved the quality of the manuscript.